My mother got cross when I admitted to using frozen spinach. (But she is a purist that thinks nothing of growing her own vegetables and herbs.) What can I say? I know the fresh stuff is delicious and cheap and in season. I just always feel cheated, bringing home an enormous bag from the market, washing it, sauteing it only to find a miserly heap of green, a tenth of the original volume. My expectations are lower for the frozen stuff. And sometimes you are standing in line at the Paris Store, the Chinese supermarket, at the end of a long day at work and you decide you need a first course because the chicken legs look too skinny. And you aren’t queuing up again, or buying anything else, because the plastic bags are carving grooves into your fingers. But you do want to impress your guests. And you did buy 30 eggs for baking. And there is spinach in the freezer. These cocottes – or oeufs en cocotte – to give them their proper French name only take a few minutes to make but in their individual dishes they look fancy and taste better. The sesame oil and miso paste add an extra kick without overpowering the spinach. It tastes more complex than it is, with all the umami of salmon. 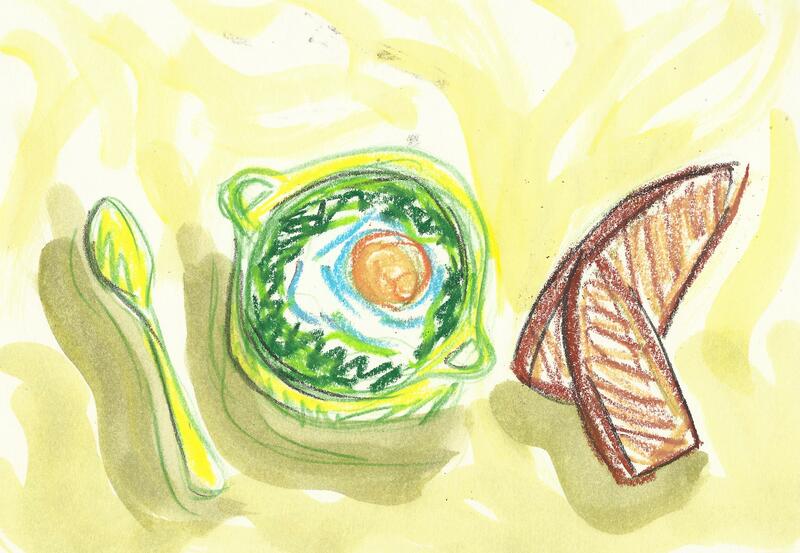 The egg yolk should be runny for dipping your bread, the spinach neatly coated in cream, tangy and salty. It somehow surpasses the sum of its parts. Works equally as a starter for a dinner party or jealously guarded for a solo dinner (I can eat at least two). For individual portions, you will need 4 small ramekins (8-10cm wide). Or else one oven-proof baking dish (approx 16cm) to bake them all at once. Heat oven to 180C. Gently heat frozen spinach in a saucepan until it defrosts. Add the sesame oil. Chop the shallots/spring onions finely and add to the pan, saute until soft. Then stir in the miso and cream and cook for a minute, just to heat through. Divide the spinach between the four dishes and hollow out a hole in the mixture. Crack an egg into the hole. Sprinkle over some salt and pepper. Bake for 15-18 minutes until the white is no longer translucent but the yolk is still runny. Serve immediately with a baguette tradition or thin slices of toasted sourdough.